CRYSTAL CITY, VA. — The director of the Navy’s Surface Warfare Division said the Navy is making choices in three areas in planning: How to “hit the bad guys first,” how to “keep from getting hit,” and how to “make sure you can back-fit” as new technologies emerge or existing ones are modified to meet new threats. Speaking on Tuesday in, Rear Adm. Peter Fanta said the Navy had the option of building, “to four to six exquisite ships” with all the advances in technology possible, while knowing such a program “will take the next 15 to 20 years” to complete. “Or I can build 20 modified LCSs in less than half the time,” a plan the Navy is following in its small surface combatant program. He said those ships would be more survivable in air and surface fights and not only recognize a submarine operating nearby but know when a torpedo is heading her way than the current LCS. The ship also would be better armed for offensive operations and capable of operating in small surface groups. The idea is to make sure an “enemy has to worry about me coming to get him,” Fanta said at a session on the opening day of the Surface Navy Association’s 2015 symposium. Fanta said the Navy was actively engaged with warfighters and shipbuilders in the program. “What do you need to make an enemy sweat?” was the question asked of warfighters. “We make those trades at the warfighter level” in a context of affordability. Among the steps taken to improve survivability, he said, was adding armor around the magazine. “We’re still firming up requirements” for the new ship. Fanta said that the two shipbuilders – Austal USA and Lockheed Martin – offered us an option for everything.” When the request for proposals comes out “before summertime,” he said, “it won’t be a surprise” to them. As for its reception on Capitol Hill, especially in the Senate Armed Services Committee (SASC), Fanta said historically the costs for the first ships in a program are higher than estimates for the total class buy, but as in other programs, the LCS is now coming in at estimated costs when adjusted for inflation. 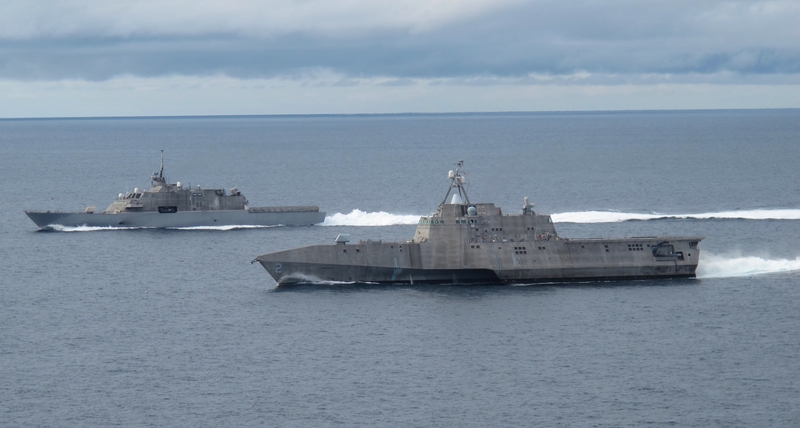 Committee Chairman Sen. John McCain (R-Ariz.) has been a longtime critic of the LCS on a number of issues, including costs. “If it floats, it fights,” he said about the Navy’s concept of how to distribute lethality in a time of constrained resources. The fleet will number 284 ships in the coming year; in the Korean War, the Fleet had about 1,000 ships. The demand on amphibious forces and platforms is continuing to rise, he said. After more than a decade of hard use with frequent extended deployments, “we need to reset the force” and keep it on a scheduled maintenance course. “We’re under pressure to do the right thing” in defining requirements and keeping costs down in new buys and overhauls. Using the decision to go with a wheeled Amphibious Combat Vehicle as an example, Walsh said that the variant that skimmed across the water was too costly. That same decision to go with a wheeled vehicle, however, also meant that the Marines needed to extend the life of its air-cushioned landing vehicles and other ship-to-shore connectors. He called the MV-22 and F-35B game-changers in how Marines operate. The Navy and Marine Corps are seeking other at-sea platforms from which to fly MV-22s, but he said for now the Joint High Speed Vessel will not be among them. He cited the weight of the aircraft and the heat it generates as damaging to decks in takeoffs and landings. For the Corps, there would be an added benefit of flexibility in having more Marines afloat to respond to crises or disasters or training with foreign forces. That would eliminate the need for the land-based Special Purpose Marine Air-Ground Task Forces. Walsh said it is essential to “maintain the shipbuilding plan” for the amphibious force. “We start with cost first.” Coupled with that was “achieving ship expected-service life and improving operational availability” while leveraging where possible advances in technology. Echoing Fanta, he added, “We can’t have those exquisite systems” that take more than a decade to design and build.